I had the pleasure of working with our lovely Italian Chef, Cristina Ronchi, yesterday for a superb morning of Sushi making. Setting up in the client’s kitchen and eating area within their offices, Cristina and I ensured that the 4 teams of 5 guests would be adequately equipped with all the necessary equipment chopping boards, knives, rolling mats etc and the food items for their menu. Each group made Prawn Nigiri, Eel California rolls, Salmon ekka maki and vegetable/fish California rolls. The teams were scored on presentation of the finished pieces and how well they had filled and cut their sushi rolls. As the items they prepared would be eaten for their lunch, we also included a dessert of a patisserie fruit flan. With the base pre-cooked, they had to mix the filling, cut and arrange the fruit in a way suitable to sell in shop and then make the glaze to finish. Marks were given for quantity of fruit used, the presentation and the consistency of the filling and glaze. After a demonstration by Cristina the groups started work on their flan and I must say that the finished articles were worthy of a patisserie shop! They had been shown different ways to cut the fruit so that it could be artistically arranged to ensure it was appetizing enough to sell. As we had to keep to a tight schedule, they were only allowed 40 minutes to complete the task and then the Sushi demonstration was underway. 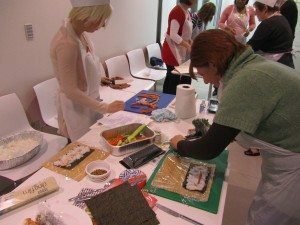 Cristina had pre-prepared the sushi rice as there were no hobs available in this particular kitchen but this can be done on the day as an additional skill for groups to learn. An additional 45 minutes would be required bringing the total event time to 3 hours. 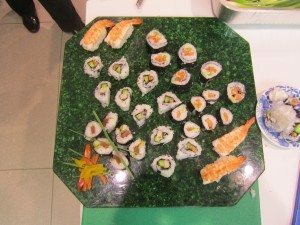 The groups did extremely well as making sushi rolls is not an easy skill to learn and the finished displays were superb. It was very difficult for us to score the teams but an overall winner was announced and the client had organised for sushi kits to be given to each of the winners. Champagne was then served as the group enjoyed their sushi and dessert. The recipes and instruction booklet were given to each guest to take away and hopefully enjoy creating the items in their own home! This is a superb activity to get people working together as well as going away with new skills learned. Thanks to the wonderfully enthusiastic Cristina Ronchi and the guests who really put their all into having a great morning’s activity. 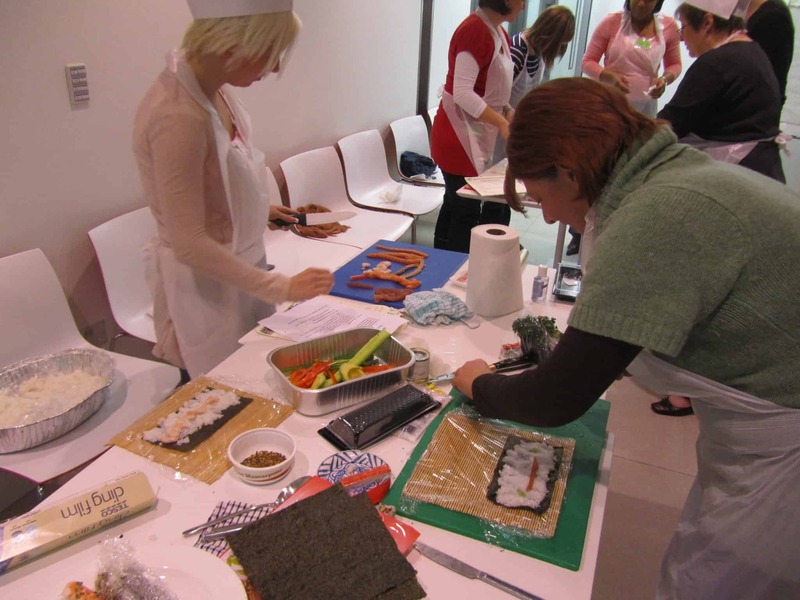 For more information on our Sushi Making event’s please contact us!